A little while ago we came across a new program on Netflix which Evelyn has fallen in love with watching. Its called Spirit Riding Free from Dreamworks animation and it follows a city girl called Lucky and wild mustang horse named Spirit. Lucky navigates this new world with her two new best friends, Pru and Abigail by her side. The trio embark on thrilling adventures, find genuine friendship, and discover what it means to be free! 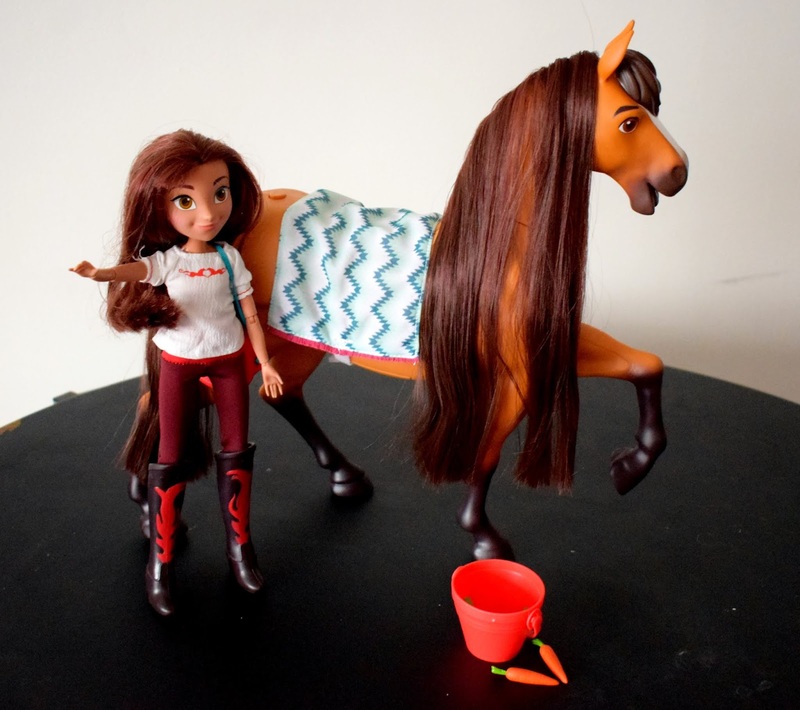 Evelyn adores animals and so when we first started watching Spirit Riding Free I knew it would be a big hit and I wasn't wrong. 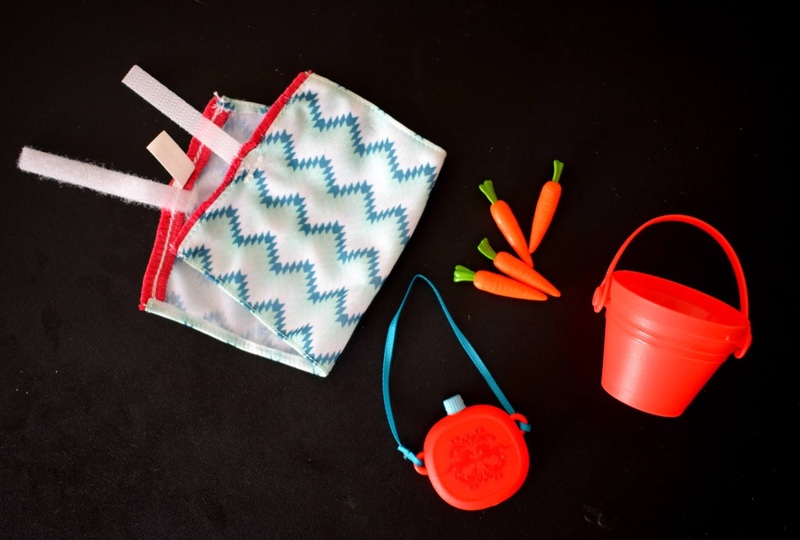 So you can imagine her delight when she was recently offered the chance to try out and review her very own Spirit and Lucky feeding toy set. The box is huge and inside you will find 1 pieces which include a really good size Lucky doll with fully poseable arms and legs which makes her easy to move when playing and means you can easily sit her on top of Spirit. The box also contains a large Spirit the horse who is posed with one hoof up. Unfortunately his legs don't move which would have been a lovely touch, however Evelyn still absolutely loves Spirit. You will also find Spirits blanket, a bucket, four carrots, a bag for Lucky and a special Spirit and Lucky story book, DreamWorks Spirit Riding Free: The Adventure Begins written by Suzanne Selfors so you can read all about their adventures too. 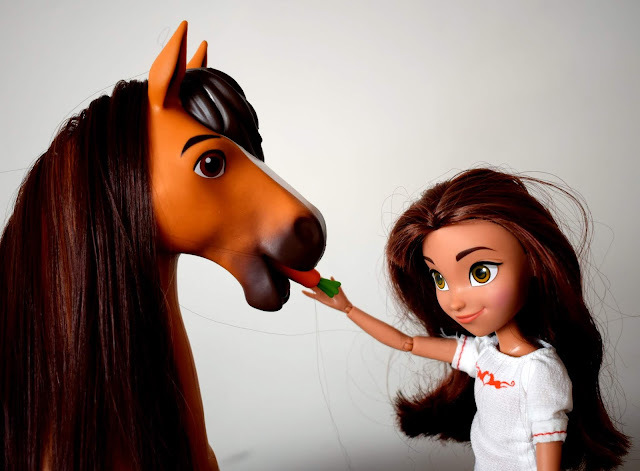 One of Evelyn's favourite things about this set is Spirit the horse and how she can really eat! Spirit can move her head up or down if you simply gentle press down on her neck. It really mimics the movement of eating/drinking but that's not all! If you take one of the carrots that come with the set, Spirit can really eat them! 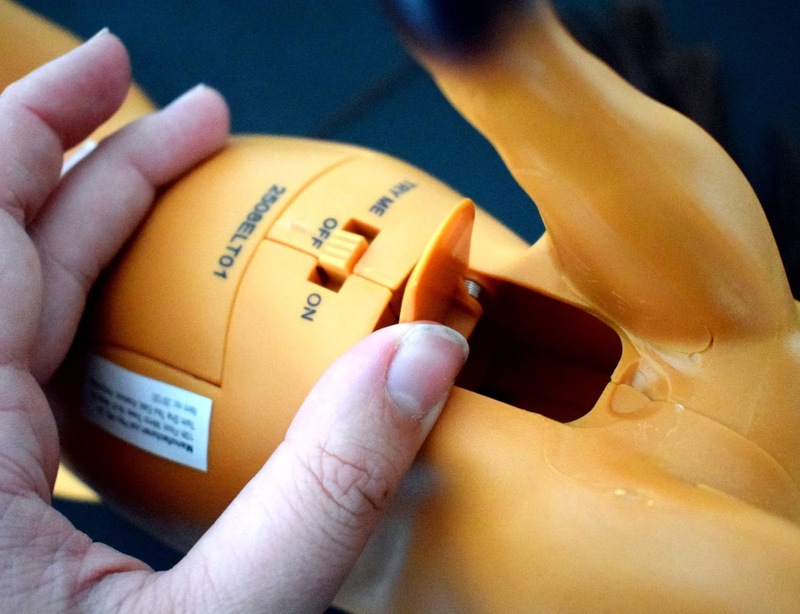 To do this you place one of the carrots into Spirits mouth then press the button on Spirits back and his mouth will move and slowly eat the carrot. He also makes crunching sounds whilst eating the carrot which Evelyn thought was hilarious. Don't worry once Spirit has eaten all the carrots there is a handy compartment underneath his belly that you can pull open to retrieve the carrots for the next feeding time. Evelyn has been really enjoying this set and its easy to see why. 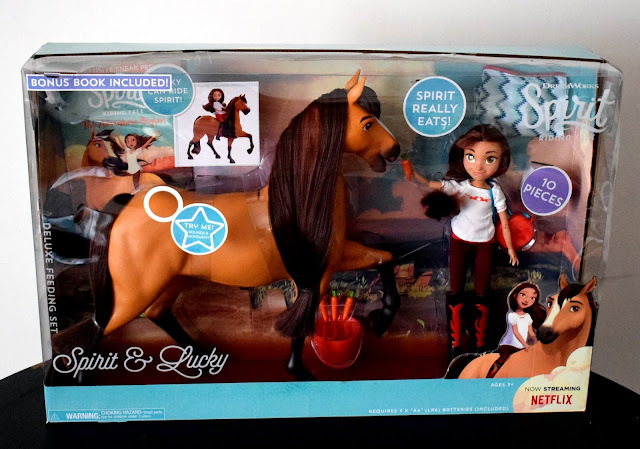 The large size of both Lucky and Spirit make it a great toy to use for imaginative and role play games and the characters look so much like the TV show versions. We are big fans of the interactive feature of Spirit being able to actually eat the characters and from a parent perspective I love that it comes ready with the batteries, so it can be taken from the box and played with straight away. The attention to detail is really good too from the silky soft hair on both Lucky and Spirit that Evelyn loves to brush down to Lucky's canteen bottle and riding boots! The addition of the book is a really lovely touch and definitely enhanced the play possibilities. Evelyn enjoyed listening to me read the story whilst she acted it out with her toys. If you have a Spirt and Lucky fan or a little ones loves horses this is a toy I think they would really love too. The Spirit and Lucky feeding set is priced at £59.99 and aimed at children aged 5+. It is available at all good toy stores and Amazon. I love Spirit, I stumbled upon it a few months back and its an alright animation. The Spirit set looks absolutely lovely. I would have loved this when I was little! Horses seem to have an unending appeal for children. 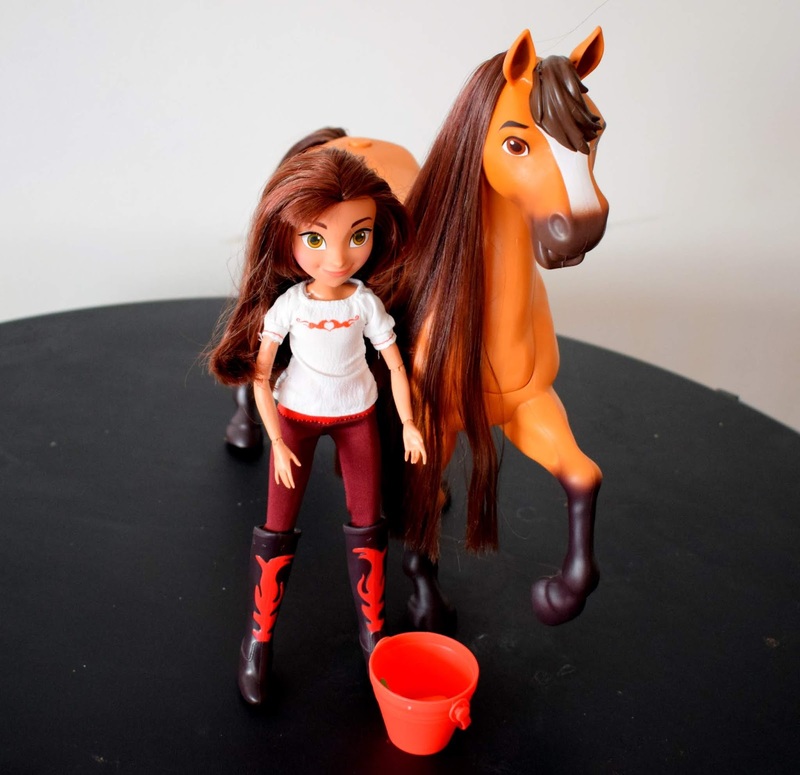 My kids love Spirit Riding Free, they have a few of the toys and I think they're fab!